The antidiabetic drug metformin and the immunosuppressant rapamycin are both FDA-approved mTOR, or mechanistic target of rapamycin, inhibitors that multiple animal studies have shown may have anticancer and antiaging properties beyond their licensed clinical applications. However, the potential to use these drugs for off-label, prophylactic use to prolong a healthy lifespan is hampered by their side effects. An international research team has now applied deep-learning neural networks to identify natural, and potentially far less toxic, mimetics of rapamycin and metformin, which could springboard the development of antiaging nutraceuticals that aren’t subject to FDA regulation. "Aging is not recognized as a disease, so we need strong potential geroprotectors of natural origin on the market. Supplements that slow down aging, affecting the key mechanisms of aging at the molecular and cellular level," comments co-researcher Alexey Moskalev, Ph.D., at the Laboratory of Molecular Radiobiology and Gerontology, Institute of Biology of Komi Science Center of Ural Branch of Russian Academy of Sciences, in Russia. Another strategy is to repurpose existing FDA-approved drugs that demonstrate off-label anticancer and antiaging potential. “…at the top of that list are metformin and rapamycin,” the researchers state. Rapamycin is an immunosuppressant administered to renal transplant patients. The drug has demonstrated life-extending and anticancer properties in a range of animal models, and studies also suggest that the rapamycin reduces post-surgery cancer risk in human transplant recipients. Metformin is used as first-line therapy for type 2 diabetes and has demonstrated multiple anticancer and longevity-promoting effects in different species. Research has suggested that the drug’s benefits in humans extend to age-related conditions, including cancer and cardiovascular disease. Rapamycin and metformin are both mTOR inhibitors that mimic caloric restriction, an intervention that has been shown to extend lifespan in many species, but can’t be practically applied in humans. Identifying compounds that mimic caloric restriction is an alternative approach that could lead to the develoment of drugs that exert the same beneficial effects, but without actually requiring reduced calorie intake. While both rapamycin and metform might seem like promising candidates for mimicking life-extending effects of caloric restriction, the immunosuppressants demonstrate long-term adverse effects. Metformin has gastrointestinal side effects that can’t be tolerated by up to 50% of people. A potential alternative approach is to develop natural compounds that mimic the observed life-extending and anticancer effects of rapamycin and metformin, but which don't have the adverse side effects. “Given the urgency of the present need for anti-aging, disease preventive interventions, it may be beneficial to look to natural alternatives, such as nutraceuticals, that would be safe enough to administer widely with little to no risk of harm and with fewer regulatory hurdles than drugs,” the researchers write. 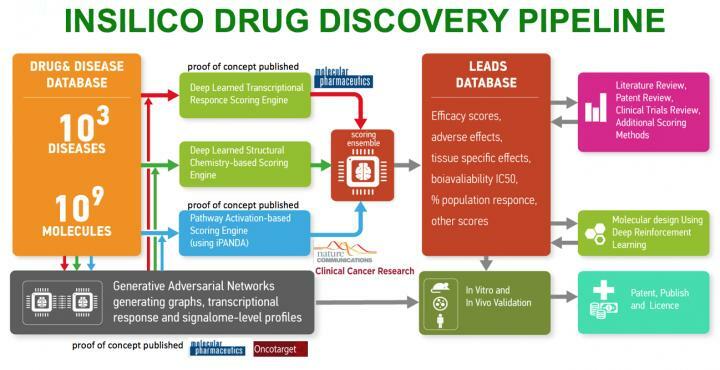 The team developed a series of in silico tools to screen a series of 800 candidate nutraceutical compounds against gene expression data from public biobanks, to identify natural mimics of the compounds that demonstrate the same transcriptional and signaling pathway activation signatures, but without the unwanted side effects. “…we focused on mimicry of metformin and rapamycin, seeking nutraceuticals that could preserve their anti-aging and disease-preventive potential while being better suited for wide-scale prophylactic use,” the researchers note. The results highlighted a list of potential compounds, including allantois and ginsenoside as strong mimetics of metformin, and epigallocatechin gallate and isoliquiritigenin as strong mimetics of rapamycin. Withaferin A was the top-scoring mimetic of both compounds. Another four largely unexplored natural compounds were identified as fairly strong mimetics of rapamycin. Another identified compound, ginsenoside, was the most similar to metformin at the pathway level. Ginsenosides are used in traditional Chinese medicine and include more than 150 naturally occurring compounds isolated from the ginseng plant (Panax species). Another metformin mimic, allantoin, is one of the active compounds in yam and has been shown to have antidiabetic activity in rat models of diabetes. The researchers stress that “the most remarkable aspect” of the metformin results was that several of the compounds that scored highest in similarity had also exhibited glucose-lowering properties or anti-inflammatory effects in previous studies. Almost all of the top hits also demonstrated anticancer potential. “This not only lends preliminary support to the validity of our methods, but also adds support to the evidence of metformin-like health benefits with these compounds,” the authors write. Geldanamycin was the top-scoring rapamycin mimetic. The compound is an inhibitor of the cancer target Hsp90 and also an mTOR inhibitor. Many of the other top hits for rapamycin also showed anticancer effects, including withaferin A. While the authors acknowledge that their results will need validation, they stress that the work not only reveals promising candidates for future testing, but also demonstrates the power of their screening approach. “That so many compounds with anticancer and other health benefits share common transcriptional signatures raises interesting questions about what pathways are shared and distinct and which shared pathways are most critical to their beneficial effects,” they note. "This study is significant not only for the identification of novel candidate mimetics of metformin and rapamycin, which as natural compounds are not subject to regulatory bodies like the FDA and which have higher-scoring safety profiles as indicated by our deep-learned safety profile classification analysis, but also for demonstrating particularly powerful screening methods that can be applied to the identification of novel and safe mimetics of other known anti-cancer and healthspan-extending drugs and compounds" concludes Franco Cortese, co-author of the study and deputy director of the Biogerontology Research Foundation, Oxford, U.K.